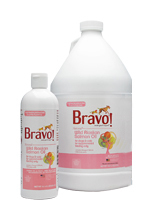 Bravo Wild Alaskan Salmon Oil is a 100% all natural oil made from from freshly caught wild Alaskan salmon. The salmon are sustainably farmed in the clean, cool waters of Alaska and then transported to a dedicated processing facility in Iceland where it is processed utilizing a “cold” extraction method to ensure viability. Immediately after extraction, mixed tocopherols (Vitamin E) are added to maintain freshness. The oil is immediately deep chilled and stored in airtight, lightproof containers until filtered and bottled. This thorough filtration process results in pure, unadulterated salmon oil with Omega 3s, as well as a naturally balanced blend of more than 30 other essential fatty acid molecules. The result is a great-tasting pharmaceutical grade Omega 3* EPA and DHA fatty acid supplement with Omega 6* benefits in the bargain. Following processing, the salmon oil is bottled in the USA for sale. Bravo Super Omega 3 18/12 Icelandic Fish Oil Blend is produced from freshly caught Icelandic mackerel, anchovy, sardine and herring utilizing the same “cold” extraction method as our wild Alaskan salmon oil to ensure purity and extra potency. This product is a highly concentrated Omega 3* fish oil with 18% EPA and 12% DHA. The Omega 3’s is this product are amore than twice that of our wild Alaskan salmon oil for pet parents who prefer to serve a higher dose of this beneficial fish oil. This product is a pharmaceutical grade, no-odor, GMO free, certified sustainable toxin-free fish oil. The result is a properly balanced high potency Omega 3 / 6 fatty acid supplement for both dogs and cats. For a better understanding of your cats’s needs for supplements, download our free Beginnings booklet here. Feed by adding to their daily meal. Store in a cool, dry place away from sunlight or refrigerate.